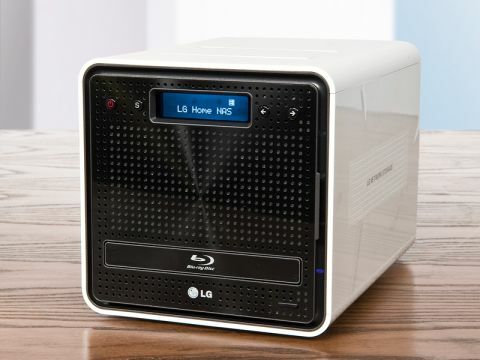 LG's N2B1 is the world's first NAS (Network Attached Storage) box with an integrated Blu-ray writer. The benefit of this is obvious: you can quickly and easily archive off upwards of 50GB of files to Blu-ray media as and when you need them. However, this burner won't play commericial BDs or rip them to the drives. The unit itself is well designed. The glossy white casing with black door means you won't immediately feel a need to quarantine it in a boot room, and there's a pop-up cardreader (SD, XD, MS) and USB in the roof for easy backups. In use, it's pleasingly quiet. A peek around the back reveals a Gigabit Ethernet port, Kensington Lock, two 2.0 USBs and one eSATA connection. The USBs allow you to bolster storage with extra drives. The N2B1 is reasonably straightforward to use, and the web interface is also one of the cleanest dashboards you'll find, although not as intuitive as I'd like. As a media server it's appropriately appointed, too. It can be UPnP-enabled, meaning that it can be seen across a network without further configuration by other UPnP devices, and has both an iTunes server and integrated BitTorrent support in the shape of the lightweight Transmission client. On my network, I could stream files to an Xbox360 and PS3, as well as a Popcorn Hour HDX box and WDTV client, without problems. There's a variety of configuration options for the two drives. You can run them stripped for 2TB worth of space, a 1TB mirror or a combination of the two. The Selective Mirror mode allows you to specify which folders you want to back-up. Other niceties include a programmable hibernation mode – instead of sucking juice relentlessly through the night, you can put the unit to sleep, reactivating it when it's likely to be used. Mac users will also be pleased to note the device supports Time Machine, the Apple back-up system. Overall, the N2B1 is an attractive option for those who are looking for a versatile media server. Additional server support would have been welcome (I'm thinking that Twonky would have been a nice fit), but all in all this is a smart, fast choice for network AV fans.